MacGregor, part of Cargotec, has confirmed an important order to deliver hatch covers, cranes, deck machinery and steering gear to two new 25,600dwt dual-fuelled Handysize bulk carriers for Finnish owner ESL Shipping. The ice-class vessels are the first to be built to new classification society rules introduced January 2016. 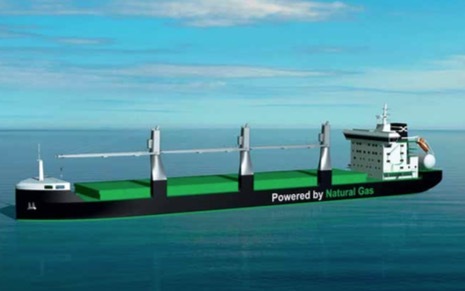 The ships have been designed to set new standards in efficiency and environmental performance and introduce liquefied natural gas-powered bulkers to the market. The 160m vessels are being built to B.Delta26LNG-design developed in close co-operation between Deltamarin and ESL Shipping by Sinotrans & CSC Shipbuilding Industry Cooperation’s Qingshan shipyard in China. The first vessel is scheduled for delivery at the end of 2017 and the second in early 2018. They will primarily be used to carry raw materials for steel and energy industries in the Gulf of Bothnia and Baltic Sea. MacGregor solutions and services for handling marine cargoes, vessel operations, offshore loads, crude/LNG transfer and offshore mooring are all designed to perform with the sea. MacGregor is part of Cargotec. Cargotec’s sales in 2015 totalled approximately €3.7 billion and it employs almost 11,000 people.